The Renaissance man of men’s tennis, Vincent Spadea. Some call him the court jester, but he can play. In fact he played his best tennis well into his thirties, while others were joining the Seniors Tour , picking up his lone title even. In 1999, he broke into the Top 20 players in the world for the first time, but in 2000, he had a string of injuries that dropped him drastically to a world ranking of 237 from 19. Vince set a new ATP benchmark with a 21-match losing streak in 2000, finally beating Greg Rusedski 9-7 in the fifth at Wimbledon. Instead of letting this get him down, he decided to re-dedicate himself to Tennis, hiring a new team to get him back in shape, eating right and staying out of trouble. And it worked. In 2003, Spadea was on fire. He went through qualifying at the Pacific Life Open and reached the semi-finals for the first time in his career, losing to World No. 1 Lleyton Hewitt. He then went on to the Monte Carlo Masters a month later and reached his 2nd semi-finals in a Masters series event. In 2004, he finally won his first title in Scottsdale, breaking another record as the most tournaments played for a first title. On route to his maiden win, he beat Tommy Johansson, Wayne Arthurs, James Blake, Andy Roddick and Nicolas Kiefer. That’s a tough lower-tier entry list! Then a few weeks later in Miami, he was on the loose again reaching the semi-finals losing to Roddick. But again, en route taking out Blake, Safin, Stepanek, Srichaphan and Calleri. He started 2005 on a tear, beating David Sanchez (remember him?) 6-0, 6-0 in 48 minutes, but his year never really got going and although there were no dramatic ranking slides, he still held a steady top 100 place. The years since have mainly been on the Challenger circuit and more recently Pro-Ams but it’s been a heck of a ride. In 2005, Vince published one of the most controversial but insightful books about the life of a tennis pro at the somewhat lower echelons of the tour. Vince’s candidness is actually refreshing when compared to the fairly safe player autobiographies out there., such as James Blake’s. He has plenty to say about other players but he doesn’t trash talk anyone per se but he voices his opinion on his controversial Davis Cup experience and his frosty relationships with James Blake, Andy Roddick and Andre Agassi. All agreed though that Vince has talent and his list of top players he has beaten (in their prime) is impressive. Lendl and McEnroe said they would have his backhand any day – that’s high praise. Vince also explains his methods for picking up girls, cleverly named ‘The Da Vince Code’. Much like Agassi’s book, his memories of particular matches and points has incredible detail and you feel like you were on court with him. He talks about the toll of all the traveling and the sometimes lonely existence of a pro tennis player, the fact you fly all the way to Australia in coach only to lose a first round is especially tough. Above all, you get to learn about a sensitive to him and his feelings towards being called a journeyman, which I for one think is unfair. He’s right when he says if you don’t crack the top 100 you’re a journeyman. Top 20? How could this statement apply? Anyway, tennis autobiographies are best when they do ruffle a few feathers, but respectfully and without trying to be nasty to anyone and Vince’s does that. Check out my Top 10 tennis books while you at it for the skinny on some of the others out there, but this one and Agassi’s are the best. “Andy’s got a great attitude and is already a bit of an icon within his generation, but he may never do better than Chang. He’s more charismatic, but results-wise, he’s no better than Michael was at this point. Really, if he were playing during Sampras’ and Agassi’s primes, Andy might be like Michael, playing a little bit in their shadows.” Vince Spadea on Andy Roddick. “I think I’ve had small indications in the past that I can go into the second week of the major tournaments. 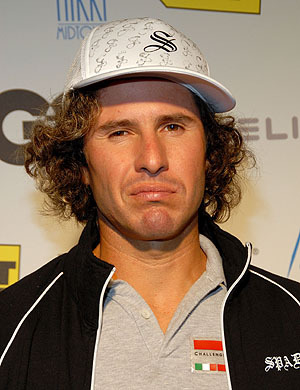 I don’t want to disillusion myself but I think it’s something I can do again.” Vince Spadea gearing up for a Roland Garros run. “I lost the edge, slid downhill. I lost the passion to win. I was playing in small towns in Missouri where they didn’t even have ball boys. My comeback is different from the likes of (Andre) Agassi, (Jennifer) Capriati, Thomas Muster. Those guys were inspirational but they had a different entourage, they had contacts. My comeback came from ground-level.” on getting back some of his rap in the post-match conferences. “I was really injured for a year, I lost my whole ranking because I didn’t play. In some ways I was out there making myself a worse tennis player for some reason. I got a team, I designed a program, and I went about it. I was forcefully, adamantly, mentally, and physically going for a comeback. I asked the people that I felt wanted to be passionate about tennis, knowledgeable, and that would encourage and motivate me to do so. I worked with Dr. Pete Fisher, I called him. I started working with a tennis psychologist off and on. I started with a great fitness program. So all the way through, this was more or less a project, and it wasn’t sort of a fluke that I’m starting to play back to my form of four years ago.” on bursting back on to the scene in Indian Wells. “The Argentineans practice on the court for two hours a day, then they must practice in front of a mirror for two more hour saying ‘I’m not guilty. '” on the Argentines on the men’s tour and drug testing. I’ve been around so long that I might be in record books for being the longest, weirdest, most pathetic great player ever. Look t how precocious I am at 33.” on his career. “If you read it, you must have been one of the 10 books he sold.”James Blake on Vince Spadea’s tell-all book. “He [Vince Spadea] was about as down and out as you could see from a Top 20 player. Then to claw his way back through the minor leagues and do it the hard way where he wasn’t young, wasn’t getting wildcards, wasn’t getting any help. I guess he decided he was just going to do it.” Andy Roddick, thinking hard about his take on the rebirth of Vince Spadea. 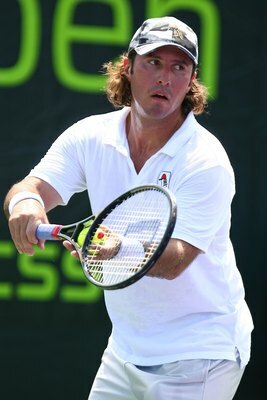 “I wore that to a sixth-grade dance.” Robby Ginepri on Vince Spadea’s outfit in Miami.